Looking for a quick addition to your meal? Only four simple ingredients combine to make this warming dish. Coat asparagus spears with 1-1/2 tablespoons melted butter, then salt lightly. Arrange in an oven-to-table shallow baking dish large enough to hold the asparagus in 1 layer. 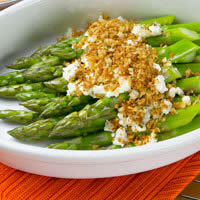 Evenly distribute cheese bits over asparagus, then sprinkle with breadcrumbs. Drizzle remaining 1 tablespoon melted butter over breadcrumbs. Bake at 400º F. until asparagus is tender-crisp and the breadcrumbs lightly browned, about 10 minutes.